There were a surprising number of options we considered for books with such long titles you forget what they are before you can find them on a shelf. And so we bring you a rather long list of recommendations. Fitting somewhat though, don’t you think? We hope you find something to enjoy! Lamar is a fantastic bowler but terrible with girls. His older brother is a basketball trophy winner, and claims all the boys’ father’s attention for himself. Then Lamar is convinced by a local bad boy that “hustling” at the bowling alley will get him his dream girl. We think this means he swindles people at the alley, somehow. Of course, his scheme goes awry and it’s his responsibility to fix it. Octavian’s mother is an African princess, and as such Octavian has grown up in a house full of philosophers and scientists. He has received a strong education in both classical and musical areas, so when he discovers that he is “owned” by Mr Gitney (the household owner) and that Octavian’s education was merely an experiment (and a skewed one at that) to test whether the African race is inferior to the Europeans, Octavian is quite rightfully horrified, and his world is turned on its head. This discovery leads to information about just how far this experiment goes, and sets in motion events that see Octavian fleeing to the Colonial Army. Set in the 18th century at the time of the American Revolution, this one’s will keep you on the edge of your seat. This is not a book for everyone. If you can’t handle the spelling in the title, skip to the next recommendation, this one isn’t for you. If your interest is ignited, read on. Billy Dean was born in a small village in a country torn apart by war. His mother raised him in secret, in a back room and he accepts, of course, the only world and the only way of living he has ever known. But he can’t be hidden for ever. Eventually the world will see Billy Dean, and Billy Dean will see the world. The reactions, on both sides, are intriguing. And the consequences are extraordinary. This is, at heart, a coming of age story, but it is much more that. It’s a book about manipulation, about perception, about faith, about what makes us human, about so many things. Firstly, this is NOT a book about werewolves. Nor is it the story of a girl who “blossoms” over the summer and suddenly becomes popular. Instead KJ finds herself as much of an outsider as she ever was in her hometown outside Yellowstone National Park. KJ is assigned to work with the shaggy-haired, intensely appealing (aren’t they always) Virgil on a school newspaper article about the famous wolves of Yellowstone. At first KJ sees the real-life environmental issue facing wolves as black and white but eventually comes to understand the multiple perspectives involved. This isn’t just about wolves, but applies to people as well as ultimately, this book is about KJ’s relationship with her dad, Virgil and the town as a whole. The lack of ‘happy-ever-after’ makes this a smart, extremely well written, and completely refreshing debut novel from Kristen Chandler. In The Boyfriend List we learn about Ruby Oliver through her relationships with boys (not necessarily her boyfriends), how these relationship affect her life and if they are at all healthy and constructive. Ruby is not a perfect character – she makes mistakes, she hangs on to boys for all the wrong reasons, she doesn’t appreciate her real friends enough. In short, she does everything that we all do. But in the end, through looking back at her dating history, analyzing her own family dynamics and talking to her therapist, Ruby learns how to be more assertive, get what she wants from her relationships with boys and simply becomes a more self-aware person. E. Lockhart’s stories have a point to make but they’re hidden in a very funny and clever writing style that pulls you into the world of real and loveable characters. You’ll be too busy laughing to notice the point being made till you stop and think about it. If you like this one then also make sure you check out the sequels (all with equally long titles) or another brilliant E. Lockhart book called The Disreputable History of Frankie Landau-Banks. Rachel Riley is the offspring of a depressingly unbroken home. Her mum and dad refuse to let her have a mobile phone, and have banned Ribena (too purple) and Eastenders (too common); her seven-year-old brother buys giant Des Lynam cut-outs and Will Young dolls from ebay and talks in Elvish; and the adopted dog eats her Pride and Prejudice boxed collection. It is time to change things. Rachel resolves that this year she will become tragic, literary and interesting – and will win the heart of Justin, the lead guitarist from Certain Death, along the way. It’s laugh-out-loud funny from beginning to end according to Goodreads. This is one of those books that people absolutely love. Why? Perhaps it’s the protagonist Junior who despite being born with an enormous head, gigantic feet, crazy eyes, ten more teeth than normal, a stutter, and a lisp isn’t a complainer. Not really. Instead the budding cartoonist is determined to take his future into his own hands. He leaves the Spokane Indian Reservation (the rez) where he has grown up to attend an all-white farm town high school where the only other Indian is the school mascot. We think people love this book because it’s a combination of heartbreaking, amusing and an engagingly written story based on the author’s own experiences, coupled with poignant drawings by acclaimed artist Ellen Forney. The Absolutely True Diary of a Part-Time Indian chronicles the contemporary adolescence of one Native American boy as he attempts to break away from the life he was destined to live. September is a twelve-year-old girl who had a pretty ordinary life, until her father went to war and her mother went to work. A gentleman in a green jacket (known as a Green Wind) approaches September at her kitchen window, and asks for her help in Fairyland. The new Marquess is a fickle teenager, but she needs September to retrieve a talisman from the enchanted woods. If September doesn’t get it, the Marquess will be taking out her frustrations on her subjects. With a gang of new friends, including a book-loving Wyvern and a boy named Saturday, September is on a mission to save Fairyland from the Marquess. This book takes place in a world like you will never have encountered before. Flora knows better than to take shortcuts in her family home, Crackpot Hall–the house has eleven thousand rooms, and ever since her mother banished the magickal butler, those rooms move around at random. But Flora is late for school, so she takes the unpredictable elevator anyway. Huge mistake. Lost in her own house, she stumbles upon the long-banished butler–and into a mind-blowing muddle of intrigue and betrayal that changes her world forever. It’s full of twists and turns you won’t see coming and Flora is one kick-arse heroine! She’s scrappy, determined, brave and best of all, gets up and keeps going even when things aren’t going her way. So there you have it – a long list of books (some of the books are long too) with extra long titles. Hopefully you find something on our list to keep your eyes and brains occupied! Time travel (maybe? ), a gritty fairy tale, and the Big Easy. Teeth, Hannah Moskowitz (February). “Rudy’s life is flipped upside-down when his family moves to a remote island in a last attempt to save his sick younger brother. With nothing to do but worry, Rudy sinks deeper and deeper into loneliness and lies awake at night listening to the screams of the ocean beneath his family’s rickety house. Then he meets Diana, who makes him wonder what he even knows about love, and Teeth, who makes him question what he knows about anything. Rudy can’t remember the last time he felt so connected to someone, but being friends with Teeth is more than a little bit complicated. He soon learns that Teeth has terrible secrets. Violent secrets. Secrets that will force Rudy to choose between his own happiness and his brother’s life.” (goodreads.com) This is described as a “gritty, romantic modern fairytale”. In darkness, Nick Lake. Shorty is a gangster in the slums of Site Soleil in Haiti, and he’s caught in the rubble of a hospital in the 2010 earthquake. As he lies there trapped, he thinks on his life so far, and his story is woven betwixt and between that of Toussaint L’Ouverture, the slave who led Haiti to freedom against the French in the 18th century. Code name Verity, Elizabeth Wein. We reviewed this book last year (here), and it’s featured on so many Best Of lists we’re hardly surprised the good Printz people also agreed. Dodger, Terry Pratchett. Dodger is a street urchin living in Victorian London. When he sees a girl jump out of a carriage he helps her escape her captors, thereby earning the interest of Charles Dickens, who reports him as a hero (the Artful Dodger, perhaps? ), changing Dodger’s life profoundly. Encounters with the Queen, Benjamin Disraeli, and Sweeney Todd follow. The white bicycle, Beverley Brenna, which we don’t have (yet). The story is a first-person account of Taylor Jane’s summer trip to the South of France, where she babysits for a family, which is challenging for a girl with Asperger’s Syndrome. For more information about the Printz Award visit the American Library Association website here. 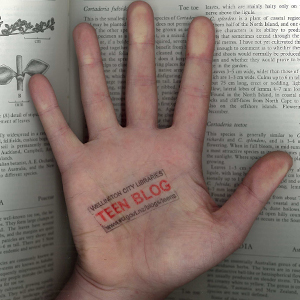 The teen blog study stop pages – full of useful links and tips. Mygateway.info – if you’ve never visited then you really should, it’s like a virtual reference collection with a huge amount of online databases (many that you can only access with your library card – google won’t help you find these treasures). They’re sorted by subject, a helpful jumping-off point. Anyquestions.co.nz – librarians online to help discover the answers to tricky reference questions, Monday to Friday, 1 to 6pm during school time. If you’re looking out of hours, there’s the manyanswers database which is a good starting point. The teen blog book lists page – for if you’re looking for some fiction to read. All the best for the school year. We have some sweet new fashion books here at the library, which you are going to loooove! As you may have guessed last week, I am quite the Project Runway fan. So imagine my delight when this book arrived! I love Tim Gunn; I want him to be my mentor. In anything, really. In Hollywood Sketchbook: A Century of Costume Illustration, author and Academy Award-nominated costume design expert Deborah Nadoolman Landis opens the doors to the dynamic world of costume illustration, revealing the world’s most sumptuous illustrations, behind-the-scenes stories of the most beloved costumes of all time, and the deft hands, sweeping visions, and creative intuitions that brought them to life. Drawing on years of extensive research, Landis has discovered a wealth of never-before-seen, original sketches and full-colour illustrations from some of the biggest names in the biz, to the lesser-known but equally important pioneers. With a deluxe, oversized, luxuriously produced package, this book is a stand-out on the shelf and the perfect gift book for anyone interested in film, fashion, and costume design history. – adapted from Global Books in Print. Our series of Vogue On: books also continues to grow, with new additions about Elsa Schiaparelli, Christian Dior and Alexander McQueen. Speaking of McQueen! We also have this super-glam new book (yus!!). I haven’t managed to get my hands on it yet; am patiently waiting for my reserve to come through. Any day! I’ve never purchased McQueen straight from a store before (hardly surprising). I must have been looking super stoked with my purchase, because the shop assistant even offered me the coathanger to keep, haha. Score! We need some help! We love John Green, we’ve recommended him to you before but we face a conundrum we cannot explain. We understand the 21 reserves on his latest (and brilliant novel) The Fault in Our Stars but why oh why do his older books suddenly have enormous queues of reserves on them? We know The Fault in Our Stars, Looking for Alaska and Paper Towns have all made it into this weeks New York Times Bestseller list but that doesn’t quite seem to explain it… If you know anything about Wellington’s sudden interest in John Green novels, can you please let us know in the comments? We’re deeply curious, as the title suggests! If we continue our theory of the New York Times Bestseller list (an excellent source of reading material btw), then possibly one of Maggie Stiefvater’s books is for you. Her 2009 book Shiver made this week’s list which is about werewolves and love stories (who doesn’t love them) and leads into the sequels Linger and Forever. If werewolves aren’t your thing then check out The Scorpio Races and, of course, The Raven Boys which we (the teen blog) have raved about before. John Green has won lots of awards, so has Neil Gaiman’s The Graveyard Book and Stardust. Both of which are fabulously funny reads, one of which is also a marvelous movie! If you’re after a road trip story, check out Morgan Matson’s Amy and Roger’s Epic Detour which is about dealing with death or Lauren Barnholdt’s Two-Way Street which is the love story of an unlikely couple. So many interesting-looking books to read this year, not nearly enough time. The Madman’s Daughter, Megan Shepherd (February) – based on The Island of Dr. Moreau by H G Wells. Juliet Moreau thinks that her father, a scandallous mad scientist, is dead. When she discovers he’s not, she travels with his assistant to the island where he is conducting experiments on animals to make them behave like humans. Which is actually pretty horrific when you think about it, considering how some humans behave. “Torn between horror and scientific curiosity, Juliet knows she must end her father’s dangerous experiments and escape her jungle prison before it’s too late. Yet as the island falls into chaos, she discovers the extent of her father’s genius – and madness – in her own blood.” (goodreads.com) A gothic horror! Eleanor & Park, Rainbow Powell (March) – a love story set in 1986, the birth year of Lauren Conrad, Robert Pattinson, Mary-Kate and Ashley Olsen, and Usain Bolt. Eleanor and Park are in high school, and are in love – true love, maybe? But no, they might be social misfits, but they – like, let’s face it, lots of other people – know that true love doesn’t happen when you’re 16 unless you’re in a fairytale. So this is perhaps a realistic story about love? We shall see! 18.01.13 | Permalink | Comments Off on Tremendous Trilogies, Volume One. After throwing lists and lists of recommendations at you over the past few weeks we’ve decided to set ourselves up for some shorter posts. Drum roll please to introduce our new segment…. Tremendous Trilogies! And we’re kicking it off with one of our favourites: ‘The Wind on Fire’ trilogy. In The Wind Singer we are introduced to the world of Aramanth in which our heroes live. It is a city ruled by uniformity where each citizen is expected to “make tomorrow better than today.” The Hath family, consisting of parents Ira and Hanno, twins Kestrel and Bowman and the youngest, Pinto, don’t fit into this system. The story opens on the day of Pinto’s first examination, age two, during which she is unresponsive to every question asked of her. Not because she can’t but because she won’t. Kes and Bo take their rebellion one step further, going on a quest to find the long lost Voice of the Wind Singer which is held by the mysterious and dangerous power that keeps the people of Aramanth in their colour-coded uniformity. Slaves of the Mastery takes place five years later. The city of Aramanth is no longer controlled by mandatory-testing, its people are free to think and dress as they please. However their defenses have grown weak, making them an easy conquest for the far off land called The Mastery. The Manth people are taken far from their destroyed city, and are forced to become slaves of The Mastery. Here, the supreme ruler, known as the Master uses dark powers to keep his population obedient. As the Hath family set out to destroy it and thus free their people, the history of the Manth people begins to be explained, including the mysterious Singer people from the prologue of The Wind Singer. Kestrel, Bowman, and their loyal friend Mumpo find themselves facing a much stronger and more sinister force force than when we last saw them, making Slaves of the Mastery a (in my opinion) much better story than the first one. Which leads us to the concluding book in the trilogy; Firesong. Those that have fled the Mastery must seek shelter, they must reach the safety of the homeland, before the storm breaks; or the coming wind will carry them away. In the time of cruelty, the Manth people march back to their homeland. They grow weak with starvation. Ira Hath is the only one who knows the way, but she is dying. Bowman eagerly awaits his calling to join the Singer people, but when his sister Kestrel is taken by bandits, he must use his powers to find her. Together they fight…. Until their destinies lead them apart. And all the while they wait for the wind to rise… Only one will sing the firesong. All in all, this trilogy is pretty awesome. It’s satisfyingly different from most other dystopian stories and has some fantastic characters who change and develop over the course of the trilogy. While the focus of The Wind Singer is on Kestrel, Bowman and Mumpo, the other two have a much wider cast of characters to fall in love with. It’s a tad heavy handed with its morals at times but still a fantastic read! Keep a look out for more Tremendous Trilogies, we’re aiming for one a month. WFW 2013 – fresh deets! 18.01.13 | Permalink | Comments Off on WFW 2013 – fresh deets! So! As you may or may not know, the very first details about Wellington Fashion Week 2013 have hit! There are 32 designer spots available during WFW, and so far WORLD, Trelise Cooper, Starfish, Kathryn Wilson, My Boyfriends Back, two WORLDS, Sabatini and Goodness have all confirmed their attendance and announced they’ll be showing. You can see the official release on the WFW page, and you can read a fab run-down here of all the news here. Auckland-based Kathryn Wilson is a renowned footwear designer, whose label was launched in 2003. Featuring many leather footwear designs, the label also produces handbags, swimwear and men’s shoes. Danielle Burkhart is the talent behind the label My Boyfriend’s Back. Fabrics are proudly sourced in New Zealand and garments are produced locally. Label twoWORLDS is based on a sustainability ethic, as is proclaimed in the ‘about us’ section of their website. Well worth a read! I love a label with heart and twoWORLDS appears to have exactly that. Their pieces are made in New Zealand, using fabrics personally shopped for and woven in Bali. Goodness is less of a designer and more of a shop… Based in Wellington with a store in the ever-chic College Street and another in Petone, the store is teeming with designer pieces from both New Zealand and international fashion labels. So, you are now in the know and up-to-date on WFW 2013. You’re welcome! Oh, and one more thing. Latest season of Project Runway started last night (for those of us who still watch tv shows on an actual tv). Excite! Dystopian political intrigue, exploring a new planet, and something for Downton fans. Shades of Earth, Beth Revis – the final in the Across the Universe trilogy. In which Amy and Elder finally get to escape the good ship Godspeed, and create a new home on Centauri-Earth. But! What of Centauri-Earth? “But this new Earth isn’t the paradise Amy had been hoping for. There are giant pterodactyl-like birds, purple flowers with mind-numbing toxins, and mysterious, unexplained ruins that hold more secrets than their stone walls first let on. The biggest secret of all? Godspeed’s former passengers aren’t alone on this planet. And if they’re going to stay, they’ll have to fight. Amy and Elder must race to discover who – or what – else is out there if they are to have any hope of saving their struggling colony and building a future together. They will have to look inward to the very core of what makes them human on this, their most harrowing journey yet. Because if the colony collapses? Then everything they have sacrificed – friends, family, life on Earth – will have been for nothing.” (goodreads.com) Fun times!